Let’s get to the travel breakdown…. What in the world is a Cat Cafe?! Oh, my friends, let me introduce you to the wonderful world of cat cafes. They’re magnificent, trust me 😉 Cat cafes are literally what they sound like. They’re cafes you can go to where you can not only enjoy a lovely drink but also socialize with adorable felines. These are super popular in Korea because having a pet is somewhat impractical in Korea. While that’s not to say people don’t have pets in Korea, just think about it… why own a cat when you can just to a cat cafe, play with one for a couple hours, and then leave? In Korea, most people live in apartments and don’t have the space or time to care for an animal. This is honestly why I think they’re so popular. Plus, these type of places are awesome for photo-opts. 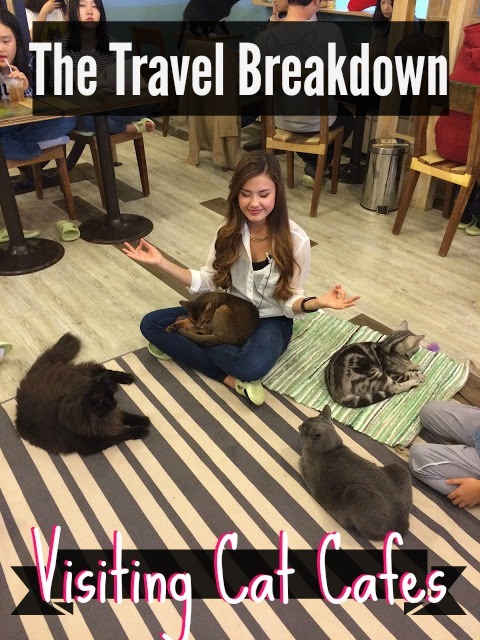 In Seoul, there are several different chains of cat cafes. The particular one we went to is called Cat’s Attic. 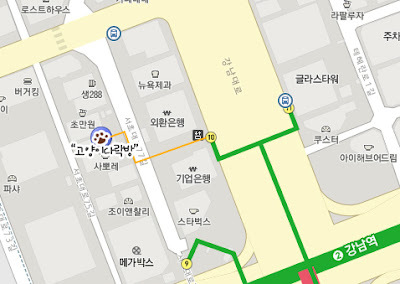 They have several different locations, but the one went to is in Gangnam. Please refer to the map below to see exactly where and you can also go to their official website (or do some Googling) to find other chains and locations! But are the cats taken care of? The cat cafe we went to seemed very cat friendly. Luckily, the cats had plenty of room to roam and lots of hidden places up and away from people just in case they felt a little overwhelmed. The cats all seemed pretty relaxed with the people and each other, which was pretty evident in all the sleeping kitties. I also noticed that whenever the workers walked around to brush or give the cats treats, they all perked up and seemed to really like the employees. The cats had fresh water and food available at all times and also an adjacent room with a litter box, which was only accessible through a little kitty door. I figured if they were really irritated, the cats could choose to go hang out in that room. Rules to make sure the kitties aren’t mistreated! One concern I had in general was the cleanliness. Overall, the place was well-maintained and I couldn’t really smell the litter box (if you own kitties like I do, you’re very familiar with that smell!). Before going, I was a little concerned as to how hygienic it could be to combine drinks and cats, but you just have to watch your drink to make sure no kitties help themselves to a couple sips. I mean, let’s face it, you’re really going to play with cats, not to enjoy drinks! haha. Also, before you enter, you have to wear slippers they provide and sanitize your hands. I really appreciate that because it shows they make an effort to keep the facility clean and their cats healthy! If you’re a cat fanatic like I am and you’re staying for a while in Seoul, definitely check out more than one cat cafe. I went to about 4 (I know, I’m insane) during my couple weeks in Korea and each one was completely different. So if you have a bad experience at one and you’re desperate to find a cat cafe you enjoy, try different ones! You’re gonna get furry when you’re playing with cats. That’s pretty much a no brainer. So try not to wear black because it obviously shows hair a lot more! I do want to note that most cat cafes have lint rollers/hand sanitizer/hand wipes available, so you can freshen up before you leave. I just figure it’s always better safe than sorry!